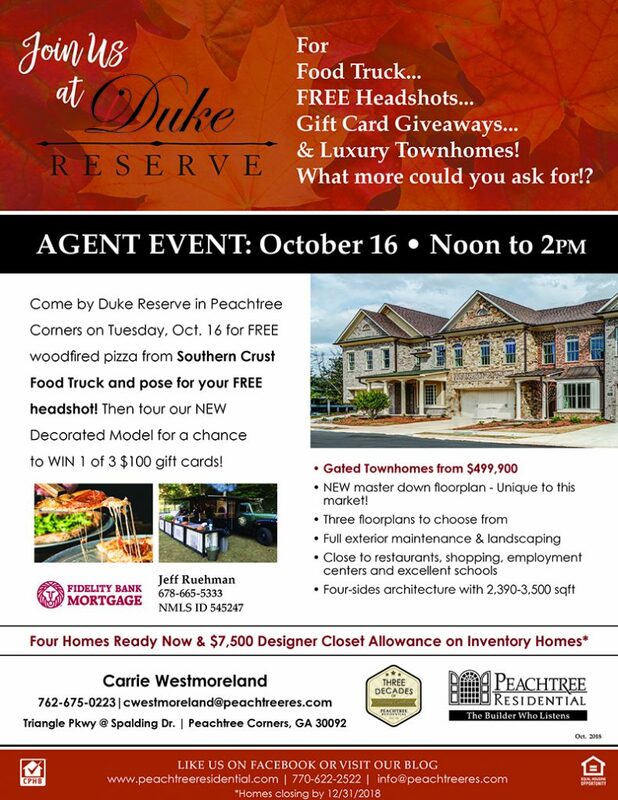 Peachtree Residential Properties & Fidelity Bank Mortgage invite you to a complimentary lunch, three hours of CE credit, gift card giveaways and to meet the Peachtree sales team on Thursday, November 8, 2012. Catered lunch served 11:30 am – 12:30 pm and the CE class promptly begins at 12:30 pm – 3:30 pm. 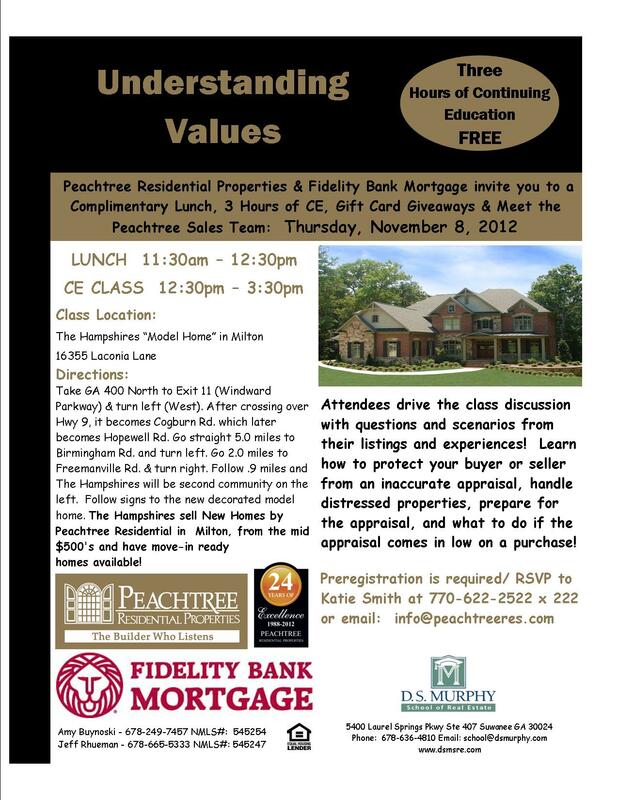 The lunch and class will be located at the new decorated model home in “The Hampshires” in Milton, 16355 Laconia Lane. The Hampshires has new homes by Peachtree Residential in Milton, from the mid $500’s and has 2 move-in ready homes available! 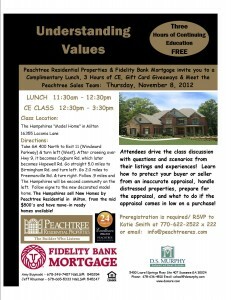 The CE class will be on “Understanding Vaules,” a class discussion with questions and scenarios from Real Estate listings and experiences! Learn how to protect your buyer or seller from an inaccurate appraisal, handle distressed properties, prepare for the appraisal, and what to do if the appraisal comes in low on a purchase! 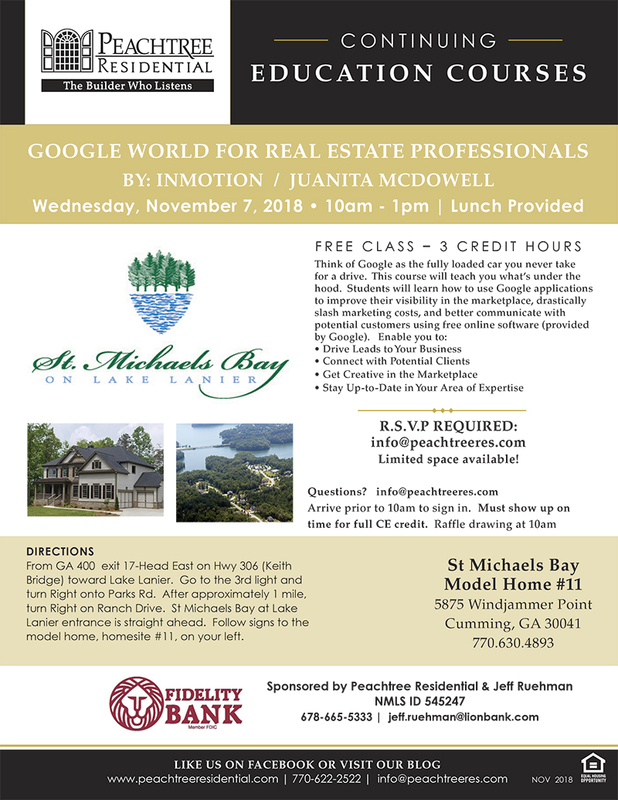 Directions to “The Hampshires”: Take GA 400 North to Exit 11 (Windward Parkway) & turn left (West). After crossing over Hwy 9, it becomes Cogburn Rd. which later becomes Hopewell Rd. Go straight 5.0 miles to Birmingham Rd. and turn left. Go 2.0 miles to Freemanville Rd. & turn right. Follow .9 miles and The Hampshires will be second community on the left. Follow signs to the new decorated model home.